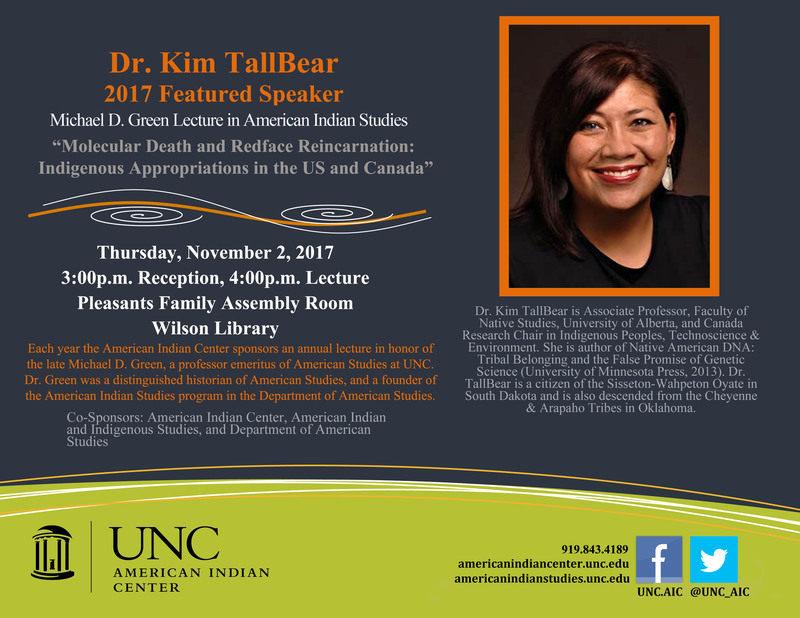 The American Indian Center sponsors an annual lecture in November in honor of Michael D. Green, professor emeritus of American Studies at the University of North Carolina at Chapel Hill. Dr. Green was a distinguished historian of American Indians, and a founder of the American Indian Studies program in the American Studies Department on campus. This lecture series recognizes his life and achievements by inviting a leading scholar in the field of American Indian Studies to give a public lecture. Dr. Justice provided an enlightening talk and we thank the students, Dr. Justice, American Indian and Indigenous Studies Faculty as well as the Chapel Hill community for making this event a huge success. To read more, see the article in The Herald Sun. Inaugural Featured Speaker – N. Bruce Duthu, Ph.D. Tribal Sovereignty and the Limits of Legal Pluralism in the U.S.